Would like to hear from people here that use them. I do not have the easy use of turning my right foot as I had nerve damage years ago and have muscle atrophy. The cages look easier to use in my situation but I have not ridden a bike equipped with them so I have no frame of reference. Any advice would be very much appreciated. Thank you in advance, Frank. I went from toe clips to clipless and then back to toe clips and finally to BMX platform pedals. I highly recommend the BMX pedals as they have small allen screws that stick up so that your feet do no slip. You can wear any shoes or sandals that you like. Give them a try, you might like them. Thank you. Is there a brand you would suggest? 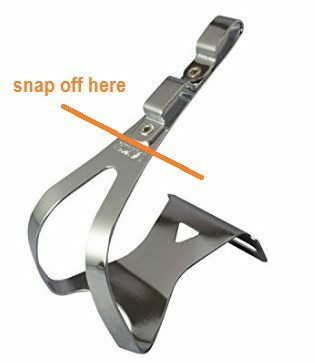 I use half-clips, and they only really serve to position your feet and help a small amount in keeping them in contact with the pedal. I have tried full clips with straps but fairly quickly took the straps off, and then trimmed the clips down (they were plastic). It's kind of conflicting objectives, because you want to be able to get in and out of them as easily as possible, but the whole purpose is to keep your shoes attached to the pedals. So the compromise of some sort is inevitable. The half clips come down on the side of being very easy to use, and real but minimal foot retention. I also went from toe clips to clipless to toe clips to platforms with pins - DMR V12s at about $50-$60. There's a WIDE variety of pinned platforms for every budget, so, how much do you want to spend? Thank you for your response. I should have mentioned from the start that I ride a flat bar bike and with my circumstance I am trying to get as much efficiency out of my effort asI can. Also I am not real familiar with the clip in method and I apologize for my ignorance. I will google "half clips" and see how that works. Again, I appreciate any and all input as I am not knowledgeable of what is in my opinion High end cycling and at my age I am happy just to be on a bike and moving forward. Platform pedals like the grip kings sold by Rivendell, also called Lambda, work fine. Highly trained racers might get a little advantage being attached to the pedals, but for most cyclists, there is no advantage in being attached except they let you pretend you are a pro. I've used toe-clips since the 1970s. 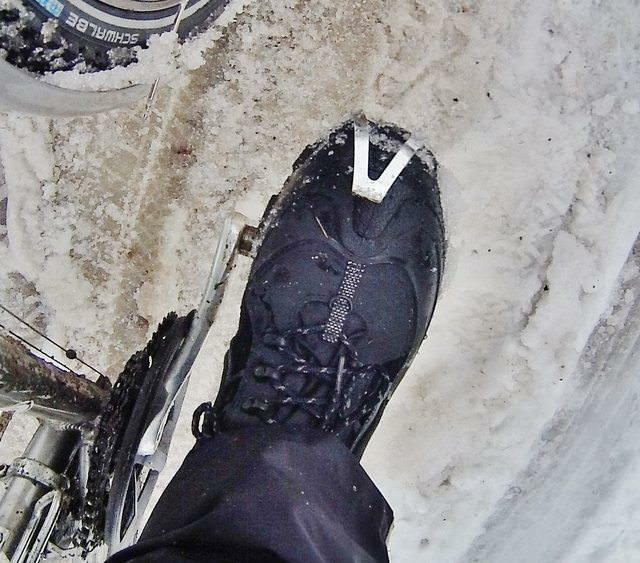 Since I started commuting seriously in 1992 I have learned to keep them loose-ish to help mounting and dismounting, and also avoid constricting circulation, which can cause cold toes and feet when riding in cold winter weather. The last few years I have also appreciated being able to change foot positions slightly. I suppose if I were interested in speed and efficiency I'd go with "clipless". But for me, slightly loose toe-cages with loose-ish straps work for me. I use BikeNashbar Verge platform pedals. I think around $50. They have other brands at considerably more money. What you want in any platform pedal are the pins that have allen heads so that you can adjust the height and replace broken ones. Extra pins come with the pedals, but I've never had to replace one. good luck. Brands of toe clips have thinned out a lot over the past 35 years, MKS is the best of what's left. I still have several others from 'back in the day'..
Been a clip/strap guy for 45yrs and still proud to use them. They hold as tightly as I wish, can use a variety of shoes from serious to casual and give me the ability to move feet as needed to prevent fatigue and hotspots on soles. I still see zero need to go clipless. If it helped me go faster it might tempt me, but I doubt it. My 77 Colnago still sports the original Christophe clips with Binda straps on Super Leggera pedals. Gives me a rush to just look at them. I agree on MKS. That's what I have on my C&V 1985 Fuji road bike. They are darn near indestructible and easy to get in and out of. Never EVER had a problem with them at all! I used toe clips until I was in my early 20's. I used ordinary sneakers as bike shoes. They developed nice grooves in their soles to aid in foot retention. I used leather straps. I always unclipped the right foot, the one away from traffic and still do with my clipless. So on the left foot, I tightened the strap and buckled it properly. On the right foot, I tightened the strap but didn't run it through the buckle, so it was really quick to reach down and tap the buckle to loosen the strap. I wouldn't tighten the right strap at all in town, just out on the road. I used rat-trap pedals, much like the ones in post 14. Au contraire, there is a huge advantage in riding with foot retention. When I was a little kid, I rode with flats. The first ride on my bike with toe clips, I felt turbine powered. I could climb out of the saddle while pulling up! It felt like I could do a power wheelie. Never managed one, though I tried. With clips or clipless, I can still lift the bike right off the road in a hill sprint. Nothing to do with looks, everything to do with performance. Interestingly enough, I use toe-clips with straps on my road-bike and clipless pedals on my track bike! Depending upon how you have clips & straps set up, there's actually quite a lot of freedom for positioning. If you don't use cleats on bottom of shoe, you have a HUGE range of adjustments, 1-2" fore-aft adjustment and 1/2" side-to-side. Not to mention unlimited float angles. 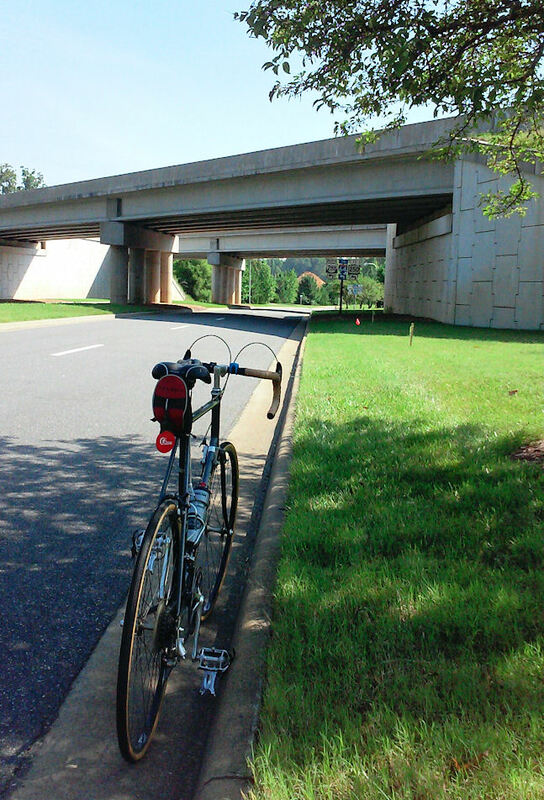 I commuted for 10-yrs to bike-shop downtown in tennis-shoes/sneakers. With cleats, yeah, you need to dial it in. There's still about 1/2" fore-aft adjustment with cleans and you can actually create additional float angles by cutting cleat-slot into bow-tie shapes. Also, you actually don't need to tighten straps so tight that you're locked in. If you have cleats on shoe, or even little ridges on tennis-shoes, that's enough to grip pedal-cage on pulling-back part of stroke with loose straps.. At rear and up part of stroke, foot is actually aimed down, so motion is still 90-degrees to pedal-cage and it still grips. There's a fraction of a second at rear 30-45 degrees up that it's possible to pull foot out, but good form there has you lifting upwards with toe starting to tilt up, so force is on straps and toe-clip. Then when you want to get out, instead of lifting foot upwards at rear 30-45 degrees, you just pull it backwards and it comes out. Last edited by DannoXYZ; 07-05-18 at 12:49 AM. I'm 60 and didn't try clipless until this year. In my teens and 20s I used toe clips with cleated Detto Pietro shoes. Now that I've tried both I wouldn't go back to toe clips unless I wanted to participate in something like Eroica. There's no advantage to toe clips unless we're wearing cleated shoes that are strapped down. I don't need the cages to keep my feet in position -- I can do that with platforms. Without cleated shoes strapped in you can't really spin -- even trying will cause the foot to pull out of the loose cage. And toe clip cages can be dangerous without the right shoes. Typically soft grippy rubber soled running or hiking shoes can grab the edges of the cage and resist pulling out smoothly when you slow for a stop. Toe clip cages were designed for minimalist shoes, form fitting, nearly skin tight with thin but very rigid soles, no grippy rubber for walking. Avocet made some good compromise shoes that kept the minimal profile but were better suited to some walking -- but those shoes are scarce now. A decent substitute might be thin leather loafers or lace up deck shoes. Foot retention -- whether toe clips or clipless -- are much more efficient at keeping the foot in place and enable more efficient use of the leg muscles. Before switching to clipless I was getting muscle spasms in my thighs, hamstrings, calves and foot arches when I tried to climb or sprint on my road bike with platform pedals last year. Switching to clipless restored my old habits of smoother circular pedaling and more evenly distributed effort. Few or no cramps -- although I still get cramps late at night in bed after a ride. Hazards of trying to stay active when the body would rather not. Mountain biking type clipless shoes are a good compromise. I use Look pedals and cleats, which are only suitable for riding and hobbling around for short distances. I like 'em for riding but they're useless for most walking. That is precisely what I have always done, since about 1969. I have absolutely no desire to change. I use road quill pedals, toeclips, and road touring shoes (stiff rubber sole), and I keep the straps just loose enough to allow me to yank either foot out. The only thing I would change would be to enter a time warp and buy up a big stock of Avocet Touring shoes, with their row of horizontal grooves, steel shank, and very walkable rubber sole. Best shoes ever for us serious cyclists who are not racers. Half clips sound like a good starting point in your situation. Easier to get in/out if you have mobility issues. If you like them, you can always get full clips. Full clips aren't efficient unless fully engaged, i.e., cinched down tight. You have to bend over while you're on the bike to do this and remember to loosen before you stop. Again, better to start with the half clips and get a feel for them. & don't miss that mess. A friend was on his bike w/ flat pedals with pins and I commented on how gnarly those must be on the shins. He pulled down his socks & showed me the gouges. The only time I've ridden not clipped in in years was when I drove to a ride but forgot my shoes & rode in running shoes- bad. Does anyone still make "cleats?" The last pair I saw was in one of those used sporting goods stores. May have been a Play it Again Sports. My first pair were made by Duegi. Hand-crated, wooden soles and vented leather uppers made in Italy. Think I paid $60 or $70 for them back in '87. They were my pride and joy. Wore those things until they fell apart. Thank you all for all this information. I will look into the half clips as a starting point.From what I have found on line the investment in not large so if it is not correct for me I haven't got a ton invested. Thank you all again, Frank. that’s a good question and one I cant answer. I have a new in the box pair of riding shoes from 1985, more the touring style that have grooves in the soles that match a pair of Superbe pedals om my ‘85 Trek 760.